Carrots out the Wazoo – Now What? On the heels of last nights awesome rainstorm across the Houston area, close to 2 inches overnight, I decided it was time to pull up the carrots. Some have just exploded with growth. See photo below. Exploded/split carrot….they taste OK but my wife refuses to let me cook them. I am in the process of prepping for cucumbers and squash plantings in the next week. The sugar snap and snow peas are still producing but the heat that disables them is just around the corner. 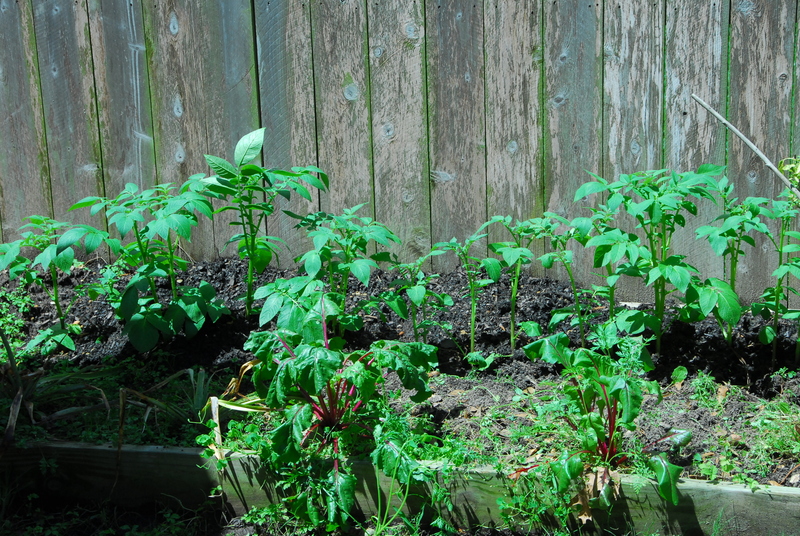 My early planting of Yukon Gold potatoes is off to an amazing start. I am using a barrel, a big tub and of course – some planted in the back bed. Yukon Gold Plants needing to be hilled up a little deeper! The freezer is full of strawberries waiting to made into wonderful jam. As they fade in the garden I am loving the evidence of a potentially great blackberry harvest! I enjoy them fresh but he low sugar jam I make helps extend the enjoyment into the fall or if lucky….till 2014 arrives. I added more strawberry scraps to the top level of my worm bins. I am now on level five and the migration up towards the top bin is underway. They seem to be a little chubbier than usual…..could it be the abundance of strawberries in their diet? – Quite possibly – they have been binge eating strawberries for many weeks now! I still recycle….lots of scraps going into my compost bins. I need some variety in recipes for Swiss Chard – at the moment it is an abundant ornamental in the garden. I can only eat so much fresh in with salads or wilted like spinach….Help! 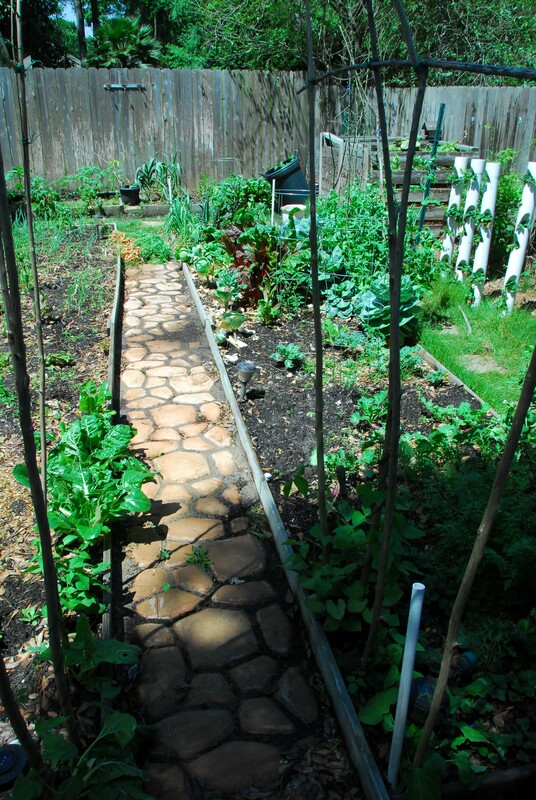 A look down the garden path toward the back beds. The poles in the foreground arch up over the entrance and soon will be covered in 3 varieties of pole beans. “carrots and more carrots” yes please! 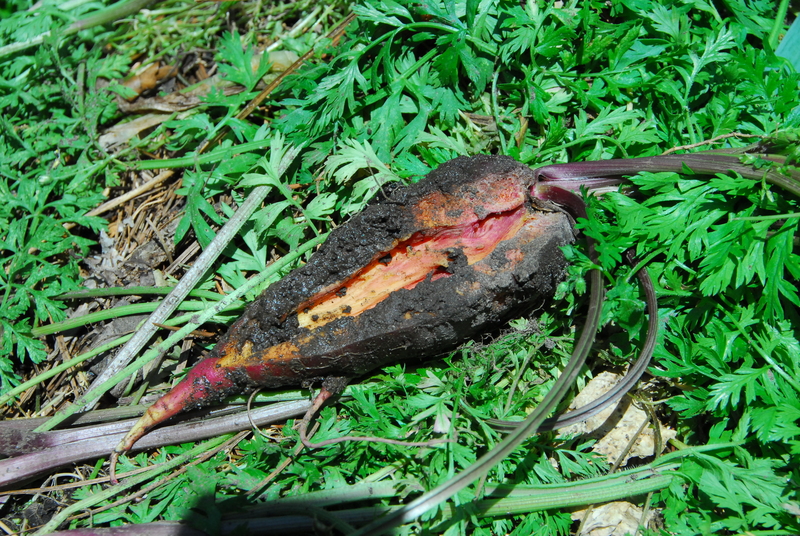 That looks like a great crop, although I’ve never seen, until now that it, an exploded carrot ! 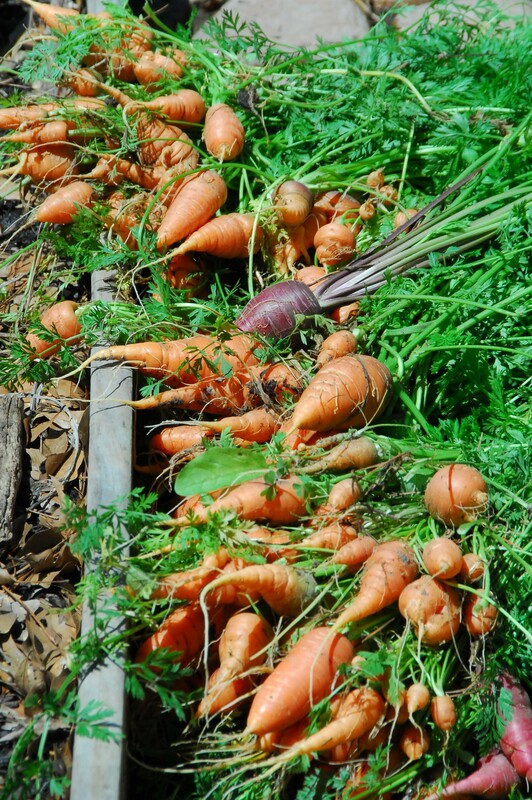 I think two factors lead to the split carrots – heavy soil and too much moisture…. Chard recipes–anything designed for spinach or kale usually works.I remember growing chard when my kids were little. My husband, son and I all loved it. My daughter not-so-much. To this day she insists that at every meal of her pre-teen years we had boiled chard, baked chard, fried chard, chard pudding, chard bread, chard soup, or chard ice cream. She exagerates–I never made chard ice cream or pudding.